Does your new mattress smell a little…odorous? You know that new smell that is formed upon opening your brand-new product, your mattress is no different. That strong odor coming from your new mattress is likely a combination of toxic chemicals used in the manufacturing process of the mattress. These chemicals embedded into the new mattress will begin to off-gas into the air of your home, leaving your home smelling unpleasant, to say the least! As the chemicals used in the construction of your mattress build up the odor will magnify, resulting in the off-gassing of VOCs being broken down in your air. Some of the main VOCs used in the construction of mattresses, specifically memory foam mattresses, include chlorofluorocarbons (CFCs), formaldehyde, benzene, methylene chloride, and toluene. Are new mattress fumes toxic? Exposure to these VOCs released from new mattresses can be harmful depending on the length of exposure and the level of chemicals present. VOCs in your air can lead to symptoms such as respiratory issues, headaches, coughing, sneezing, eye irritations, and in severe cases chronic illnesses. Below we are going to discuss the key strategies to reduce and eliminate new mattress smell from your brand-new mattress. Air it Out: Sometimes giving your new mattress time to air out away from your indoor air is the best solution. Placing your mattress in your garage in an open area with sunlight will allow for the mattress to off-gas in a safe environment. Jump on Your New Mattress: A fun way to help expedite the off-gassing process of your new mattress is to jump on it. When you jump on your new mattress it will release VOCs faster than simply airing it out. Although this does place you at an increased risk of exposure as you will be exposing yourself to the release of potentially toxic VOCs in your breathing air. Use an Effective VOC Odor Eliminating Solution: There are a number of methods that people try to use to eliminate the odors of your new mattress with including baking soda, vinegar, and even a vodka-water combination but do these methods really work? Although these methods may work to mask the odor they do not have the ability to remove and eliminate the VOCs contained in the mattress. 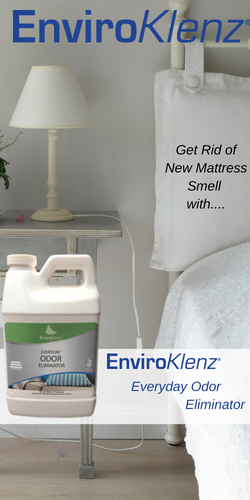 Therefore, the EnviroKlenz Everyday Odor Eliminator is the ideal solution for eliminating both odors and VOCs in your new mattress. The EnviroKlenz Everyday Odor Eliminator can be used in a spray bottle mixed with warm water and sprayed directly onto the mattress to work to eliminate the odors and chemicals from the mattress. For a strong odor pour 1 cup of the EnviroKlenz product directly to the mattress and allow it to soak for 5 minutes. Then go back and add ½ cup of EnviroKlenz and let it sit for 15 minutes before soaking up the excess water and allow it to dry.